Jean Francois Bony was a multi talented man: a still life painter, a teacher at the Fine Art Academy of Lyon, a textile designer and an entrepreneur. He was born in 1754 in Givors, a small town not far from Lyon. His father was a baker. He studied at the Academy where he was known for his lack of discipline. In 1772 he was hired as a draftsman by a fabric manufacturer, Mr. Bissardon. 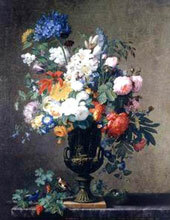 Bony made sketches and painted designs for other manufacturers, among them Camille Pernon. At the end of the 18thcentury he entered in partnership with the Lyonnais fabric manufacturers, Bissardon and Cousin. The kind of embroidered silk fabric he made was a huge sucess during the first Empire of Napoleon. He killed himself in 1825 after loosing his entire fortune in bad investments. 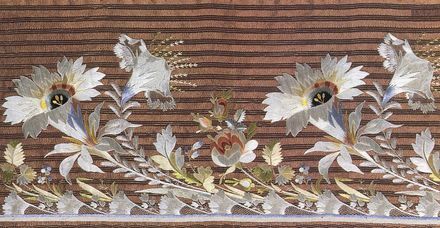 Embroidered silk border in the style of Jean Francois Bony, Lyon, circa 1800.